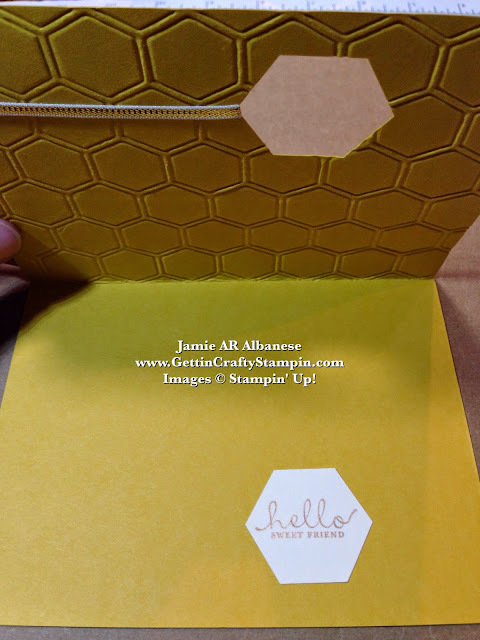 Send a honey of a card to a sweet friend with this warm and loving hand-stamped card tutorial! A hand-stamped card is guaranteed way to deliver smiles. This hand-crafted card has some rich gold accents and texture that will wow and delight. This Tool-Tip Tuesday is a great way to take people's breath away with little effort. Join me in creating this warm and loving card. I love the elegance of Gold accents on a hand-crafted card!! 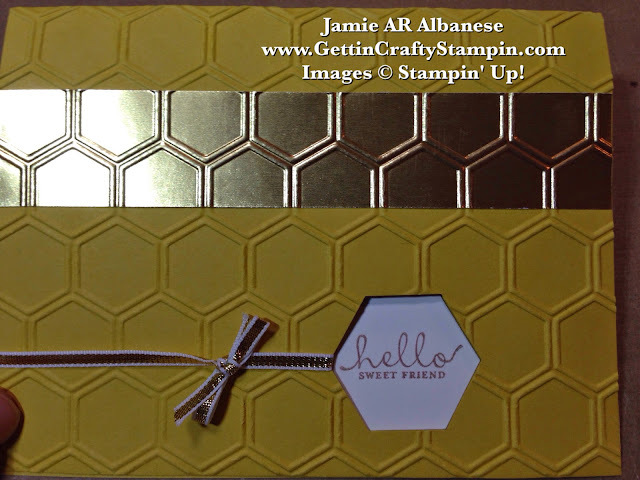 From Foil Sheets, the Gold 1/8" Ribbon and stamping the image from the Six-Sided Sampler using the Gold Encore ink pad - this card is elegant and surprisingly easy to achieve. 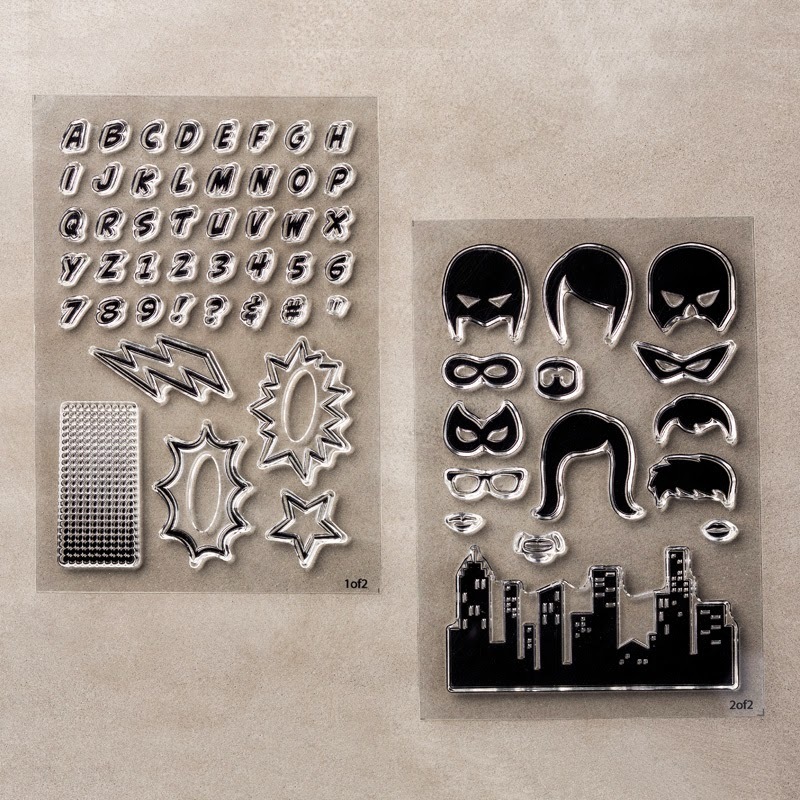 Tool Tip Tuesday: Deliver WOW results when you Emboss the Foil Sheets! Simply add them to the front of your card using SNAIL adhesive. Keeping the card open, emboss the image using a Textured Embossing Folder of your choice and the Big Shot Die-Cutting Machine. The adhesive will be strengthened as it will have the ultimate contact between the two surfaces and the Foil Sheets are thick enough to not be damaged by this technique. 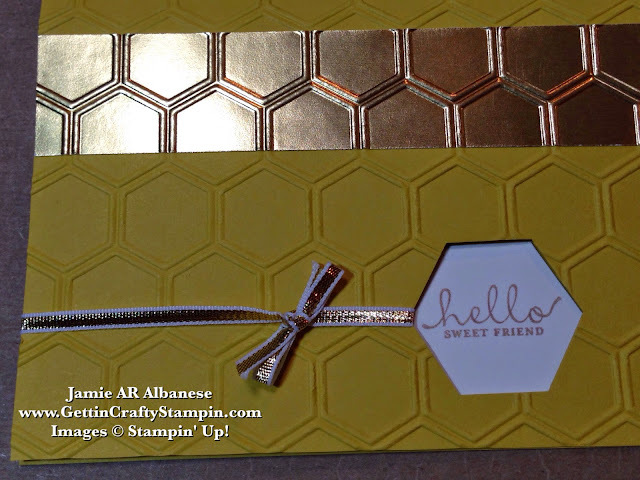 Stamping this cute 'Hello, Sweet Friend' sentiment from the Six-Sided Sampler stamp set on the Very Vanilla card stock using the Gold Encore Metallic ink pad. Punch the image out using the Hexagon Punch. Apply the SNAIL adhesive to the back of the image. 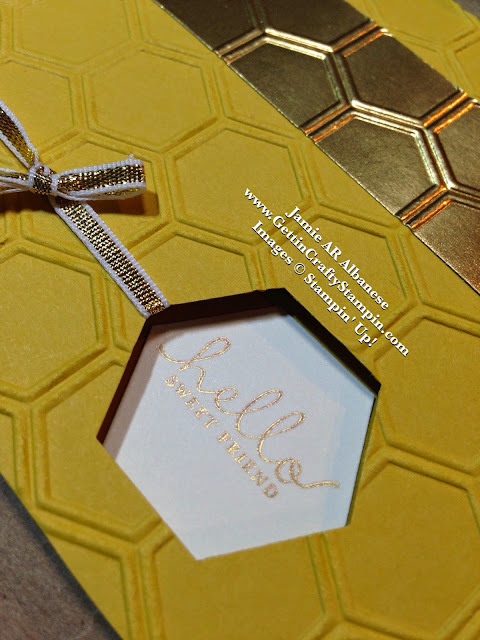 Punch the embossed card front with the Hexagon Punch and lay the SNAIL'd piece into the punched shape - this will make for a snug fit - and a perfect window. Tie on the Gold 1/8" Ribbon on the side of the punched card front. A sweet greeting waits inside this hand-stamped card. I like the window aspect to this hand-crafted card, don't you?? Bee-yond me... Celebrating life is key and sometimes life is a battle - literally! Having recently connected with BumbleBee Foundation - a Childhood Cancer Support foundation - I can't express how precious life is. Life to a child who is faced with Childhood Cancer and their families... it's massive! So JOIN ME on Nov 6th - or Use this Hostess Code (ECSMF6BX ) when placing an order and all proceeds will go to support the BumbleBee Foundation. Create hand-crafted cards that will be mailed to the families (parents, siblings and patients fighting childhood cancer) at our Blessing Card Events! They have a Wish List of items that they'd like to use in creating cards that will encourage the kids and their families. Email Me and I'll get you their Wish List - like this great 'Calling All Hero's' stamp collection... perfect for those kids and their families fighting Childhood Cancer. Send a warm and stylish hand-stamped card that has stunning Gold Metallic accents and texture. 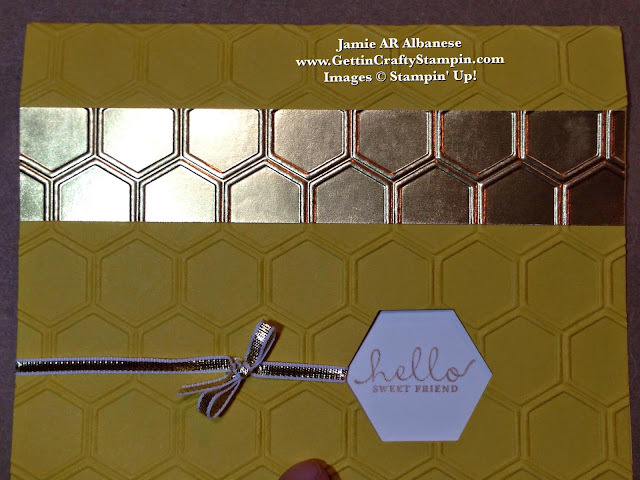 With a simple technique you can deliver metallic texture to your hand-crafted card that will WOW! With metallic accents being all the rage, this hand-crafted, rubber-stamped and embossed card is taken from warm to rich and elegant. What would YOU do with the Foil Sheets? Embossing them using the Big Shot is a sure fire way to amaze all who see it.